Skip Sullivan is a 1969 graduate of Oak Lawn High School. He was a three-sport varsity athlete in football, basketball and baseball. He continued his football and baseball careers at Iowa State University. He graduated from ISU in 1973 and returned to his alma mater to teach and coach. Skip retired from teaching in 2006 and continued as part-time athletic director and head baseball coach until 2008. He is currently the assistant varsity girls basketball coach. Skip started coaching baseball at Oak Lawn High School in 1980. He was named the head coach in 1994. In the past 14 years, he has won 268 games, 2 conference championships and helped many players go on to play Division I, II and III baseball. Skip’s accomplishments as a baseball coach include: 1996 Pitch and Hit Coach of the Year; 1993-1994 and 2007-2008 Oak Lawn High School Fred Parks Coach of the Year; 1994 and 2000 Worth-Palos Reporter Baseball Coach of the Year and 2005 SICA Baseball Coach of the Year. He has also coached football, boys and girls’ basketball, and golf. In 2009 he was inducted to the Illinois Baseball Coaches Association Hall of Fame. Skip is the son of Gene and Doris Sullivan. He has 3 sisters, Nancy, Janet and Gwen. Skip has been married to his wife, Patti, for 35 years. He has two children, Mike and Dana. In 2005, he was diagnosed with Parkinsons disease.He decided to approch this disease in the same manner that he has approached everything in his life - with a positive attitude and eternal optimism. 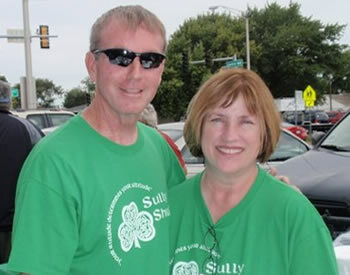 Photos of Skip "Sully" Sullivan. Scroll through the slide show using your mouse or the Right and Left arrows on your keyboard.